A conversation on creativity with Michelle Tibbits, a confessed “artsy fartsy” and recovering compliments “shyoholic”. 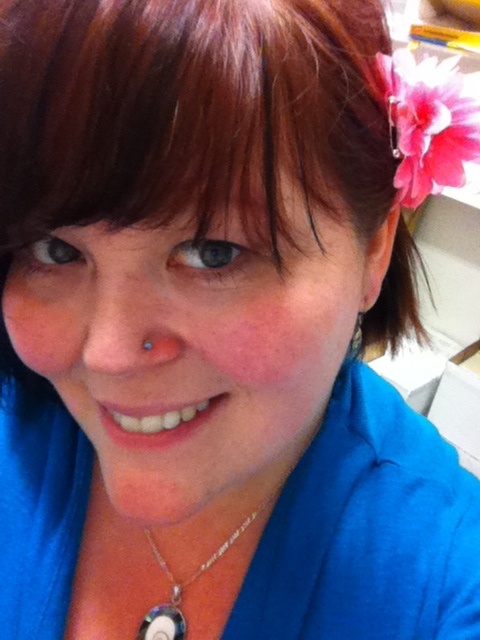 Michelle Tibbits is the friendly and smiley face that is likely to greet you when you enter The Treehouse. “She oozes goodness”, as our Jackie Blackmore would say. She has worked at Semiahmoo House Society in various roles for nearly 2 decades. In addition, she is a talented artist who reveals herself in the full artistic spectrum. The following conversation reflects Michelle’s insights on creativity, including a heart-warming example of how discovering his own creativity made one man very happy. Tell me how you’ve witnessed creativity with people who participate in our programs? It’s great that our Rec and Leisure Program, through the Extravaganza, provides people the opportunity to be performers, singers and artists. The level of art that comes out of the Program is incredible and allows people to express themselves through creativity. During the Extravaganza performance, I saw smiles I don’t see on a daily basis. I watched pride, growth and expression. I got joy seeing them blossom on the stage. Even my husband was tearing up. The performers felt good about what they were doing. They felt special when people applauded their hard work. Any form of art is hard work; it’s hard to put yourself out there to be judged. The Day Program also encourages much creativity. People create art, sewing projects, music and plays. They decorate the building with what they make, creating opportunity for participants to express themselves in so many ways. The Program also brings into the building different types of performers to share their art form and culture, providing new experiences which promote personal growth. All of this plays a role in encouraging people to create from within. Photography is another form of creativity. The fact that Janek (Janek’s work will be featured in the Fall Newsletter) is such a talented photographer who actually sells his form of art is inspiring. Also, participants in Rec and Leisure created a vibrant mixed media painting that is proudly displayed here and it has a rock glued on it that says “inspire”. To me, that is a perfect message for everyone. That painting is one of many living here in the building that has been created by various artists. To me that shows how much we embrace the creativity of others and recognize how much of a positive impact that can potentially have. Do you think that vulnerability also plays a role in this? Absolutely. You have to allow yourself to be vulnerable. That means you embrace the opportunity to be yourself and that makes you stronger. Vulnerability is good because if you feel strong enough, you can be out there and open up to more people. If people stay where they know; they’re never vulnerable but they don’t grow either. I think that creativity, vulnerability and growth are entangled. How has creativity helped you in your work supporting people? It helps me think outside the box. I have one particular example in mind. His name was Stan. One day, he saw me draw and he said, “I would like to draw.” I handed him a pencil and some paper and I said, “OK, here you can draw.” He tried it then he said, “It’s colouring that I want to do.” I drew him a picture and gave him some colouring pencils. He coloured it and enjoyed himself. One day, Stan and I went to a casual drop-in ceramics place that was laid back and easy going. That way, Stanley could do whatever he wanted. He chose a big pig to paint. Then, he asked me, “What should I paint?” I told him, “It’s your pig, you paint it whatever you like.” He stamped the pig and I helped him make the stampings look like flowers. Here we had this huge pig painted with flowers all over it. 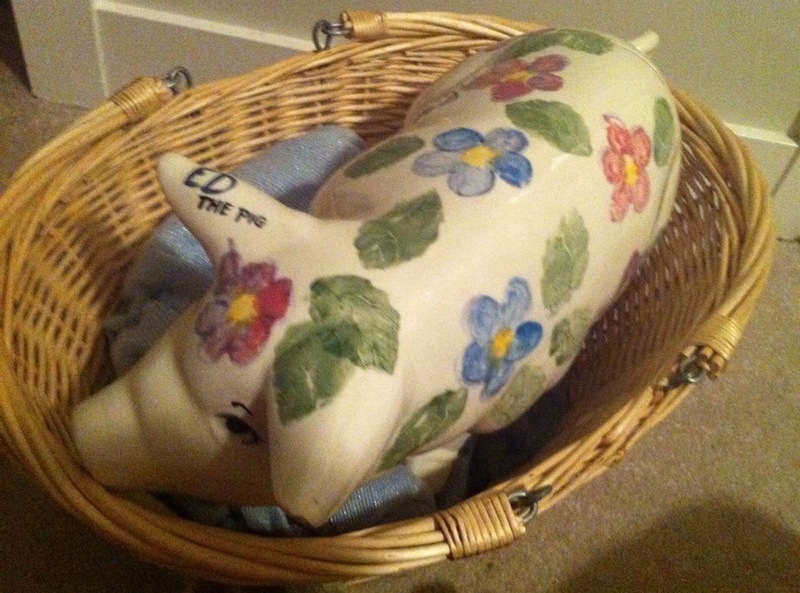 Stan named the pig, Ed. 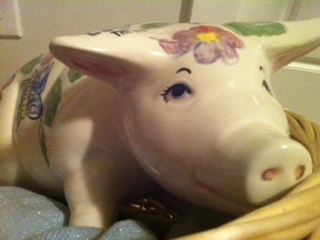 Once Ed was glazed, he looked so fabulous that someone offered to buy him. Stan was very proud that someone would want his work. I’ll never forget that time. Stan was so proud of Ed that he had him living in a basket in his room and he would cover him at night. When Stan passed away over 10 years ago, he left Ed to me. I have him still living in the basket in my house. Do you believe that creativity is related to wellness? Creativity is a good way to release stress by escaping into a different world and doing something that feels good. Creativity releases toxins; it’s cleansing. Personally, I have to make time for my art. If I don’t, I don’t feel rested. My art gives me the opportunity to be free. How has creativity contributed to your own growth? My husband is an incredible artist and I would hide my drawings from him. One day, he told me, “This is yours; you own it. It’s from the depth of you and to share it with me would be an honour.” I had to agree with him. The experience shifted my mind and now I let him watch me draw. In turn, this is what has helped me be comfortable with things like painting the Semi doors at Christmas or sharing my music. I didn’t feel comfortable with compliments either because it meant that I was the focal point and people were paying attention to something that was very personal to me. Now, I’m able to accept compliments a lot better mostly because I have realized that it is ok to feel a sense of pride. Understanding what a huge impact that had in my life is probably why I am such a strong advocate for helping people express their inner creativity – whatever form that may be. Prior to those insights, I never considered myself an artist—just artsy fartsy—but once I got the courage to let other people in, I was able to believe myself to be an artist and call myself one. I think of how many people write and they never show their words to another soul because they think they’re not good enough or their inner being will be judged. Showing your art to someone means being strong enough to allow someone in. That’s a big compliment for that other person and it’s a big step forward in self-confidence for the person sharing. What is creativity not about? It’s not about being perfect; it’s about expressing yourself. Do whatever you do and don’t compare yourself. Again, it’s about that freedom of being yourself and vulnerable and developing the strength to get up there in front a room full of people or maybe even just one person to share part of yourself with, because creativity is a part of who you are as a whole. At Semi, people are allowed the freedom of being themselves. If they can’t be free, how would they express themselves? I so believe in the arts for those reasons. This entry was posted in Blogs by Louise Tremblay, Creativity, Staff Features, Uncategorized and tagged creativity, developmental disabilities, independence, personal development by The Semiahmoo Foundation. Bookmark the permalink.